The Province of Canada, which existed as a political entity from 1841 to 1867 and consisted of what are now Ontario and Quebec, was the first part of British North America to adopt the familiar decimal system of currency by an act passed in 1857. The decision to adopt a decimal system was made on the basis of the increasing trade between British North America and the United States as well as the presence in Canada of the Spanish-American 'dollar' (eight- real piece) and U.S. coins. Canada's new decimal coins consisted of bronze cents dated 1858 and 1859 and five-, ten- and twenty-cent silver pieces dated 1858. The twenty-cent denomination was a 'pure' decimal fraction of the dollar ( 1/5 as opposed to 1/4 for a twenty-five cent piece) and it was equal to the 'Halifax shilling.' Halifax currency, a local pounds, shillings and pence system, had set the exchange value of the Spanish-American dollar at five shillings. The choice of the twenty-cent coin proved to be unfortunate in that people had difficulty in quickly distinguishing between the twenty-cent piece and the U.S. twenty-five cent piece, which was widely circulated in Canada at that time. 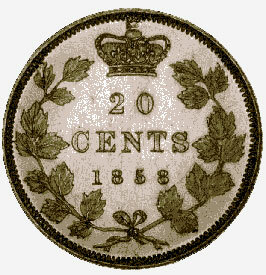 When the Dominion of Canada had its first coins struck in 1870, a twenty-five cent piece was chosen and the twenty-cent pieces were gradually withdrawn. This coin is part of the Bank of Canada's National Currency Collection.